Some of the 70,000 people who live in Alemão, outside the gaze of the television crews focusing on Rio’s wonders, nurtured hopes of a calm as the Summer Games got underway. But then came the gunfire on Tuesday, followed by more battles on Wednesday morning and an outpouring of desperation and rage. 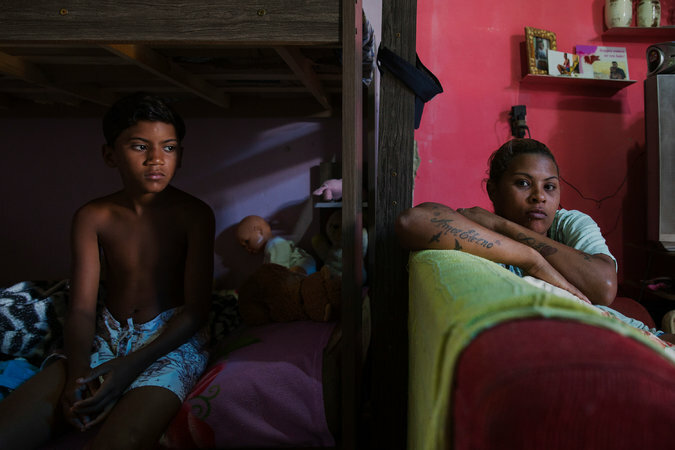 Richard Conceição Dias, 9, and his mother Jucileia Silva, 35, in their home in the Complexo do Alemão slum in Rio de Janeiro. “We live worse than those pretty horses used to compete in the Olympic Games,” said Juciléia Silva, 35, Richard’s mother, referring to the equestrian competition that took place on Tuesday morning, around the time she and her family dove to the floor to escape gunfire.